First off, if you’re reading this, you’re probably going through the excruciating process of dealing with canine separation anxiety. I know how hard this is. And I want you to know one thing: you can beat it. Second, know that separation anxiety is not your fault. It’s also not your dog’s fault. Separation anxiety is often the result of your dog’s environment before they came to you. Or sometimes a dog develops separation anxiety for no apparent reason or past trauma. We simply don’t know all the reasons. But there is hope. 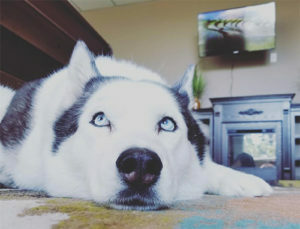 Meet Splash, my now 12 year old Siberian Husky rescue. Splash came to live with us 10 years ago after she was found wondering around in the mountains here in Southern California. She had no tags or microchip. I don’t know her story. 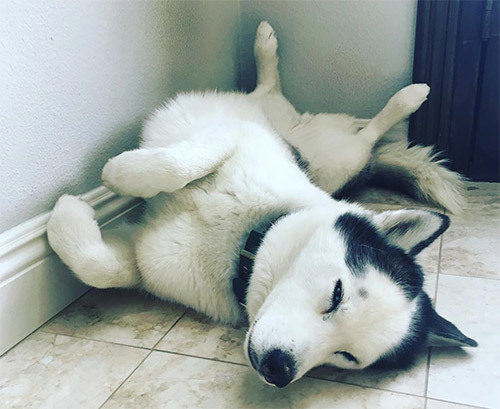 Splash was a mostly normal Siberian Husky. She liked being around people, but for the most part had no trouble being left alone in our home. About 6 years after we adopted her, something changed. Oftentimes you hear about traumatic events that trigger separation anxiety, like a change in living situation or a move. But there was nothing like that. All of a sudden we would come home to find her panting with drool all over the floor. That was how it started, and it was mildly annoying but not yet overly concerning. Then came the destruction. She’s a very agile dog, and started jumping up on counters and knock things over. Then, she tore through our new plantation shutters. Ka-ching, the bills started piling up. We tried leaving her in our backyard, thinking that would minimize the damage inside the house. But she soon learned to escape. She would scale our 6 foot concrete fence walls and get out into the neighborhood. It got so bad that I had to attach a GPS locator to her collar. I began doing my homework on what things might help calm an anxious dog with separation anxiety. First, I tried leaving her with things to do. I put out toys, treats, and chews to keep her busy. These didn’t work at all, because once her anxiety kicked in, she lost all interest in playing or even her food drive. We tried exercising her vigorously before leaving but that didn’t seem to have an effect. We tried the calming wraps like the Thundershirt, and those didn’t work. We tried pheromone based diffusers. Didn’t work. We tried training various crates and kennels. We tried to warm her up to them and make them a very positive experience. But all attempts failed. After a trip to the vet, and my extreme frustration, my veterinarian at the time suggested medication. Prozac, specifically. He warned me, however, that if this worked Splash would NEVER be able to stop taking the drug. This concerned me, and I also had reservations about side effects, but I was at my wits’ end. I loved my dog. I didn’t want her to become a statistic, another owner surrender at a shelter. I was willing to give the medication a shot. At 2 days into her taking the medication, I noticed a change. She didn’t seem to care being away from us, or seeing us leave. In fact, she didn’t seem to care much about anything at all. After a few more days, and it became clear that the medication was having a calming effect. However, I noticed her behavior also began to change. She lost her spunky personality, and much of her former energy. She slept more, and was far less interest in play or interacting with our family. But… we were finally able to leave the house. We would come home and she was just fine. I thought we had finally beat this. Or so I thought. Before you even leave your house, your dog knows what’s going to happen. Dogs are incredibly intelligent and easily pick up on the queues. Grabbing your keys. Putting on your shoes. Getting dressed. These are all signs you’re heading out the door. For a dog with separation anxiety, these signals eventually become the triggers of the anxiety itself. In other words, your dog begins to fear you grabbing the keys just as much as you being gone. The key is to teach them that these signals DO NOT mean you’re leaving. You have to desensitize them to these behaviors. For example, you pick up your keys and put them in your pocket or purse, then go sit down on the couch. You put on your shoes, and walk over and sit down and pet your dog. You walk out the door, and quickly walk back in and greet your pup. Desensitization is a process that takes many days or even weeks of work and isn’t a one time thing. Even before I began her on medication, I began to work on desensitization with Splash, and noticed that she became far less anxious when I was leaving. It wasn’t a cure by any means, but it began to help. After about 9 months on the medication and desensitization, the signs of separation anxiety began to slowly re-emerge. The panting. The drooling. And slowly but surely, the destruction. It began to wreak havoc on our family’s life again. We couldn’t leave the house for long without her working herself into a panic. One day, at the peak of our frustration, I was working from home and had to take a long phone call. I was home alone with Splash and was concerned she would begin to panic if I disappeared into my office for an hour. After the call, I opened the door expecting the worst. But there she was at my feet, asleep right by the door. Then all at once, it hit me! I realized that if Splash believed I was home, she didn’t seem to care that she couldn’t see me. I realized that while I was in my office, she could hear my voice talking on the phone, and smell me under the door. I asked myself, how can I make her feel like I’m home even when I’m not? On a whim, I decided to try something crazy. I popped open a voice recorder on my computer and recorded myself speaking. Nothing in particular, I just rambled off on anything and everything, almost like I was on a phone call. Then I bought a simple old fashion CD player with a loop function. Then I burned a CD with this 5 minute recording of myself speaking. The next day was Super Bowl Sunday, and my family had been invited to our friend’s house for the afternoon. This is my chance to try this, I thought. As we left the house, I walked out the door and hit play on the CD player which I had placed inside our garage, making sure the repeat function was set so that it would loop my voice over and over. I also took a t-shirt I had wore the previous day and placed it right outside the door so she could smell my scent. Nervously, we left for the party. After about 2 hours, I couldn’t take the suspense. At halftime, I left the party and went home to check on Splash. I opened the door expecting the worst… but there she was asleep on the ground by the door! She barely noticed me. IT WORKED! 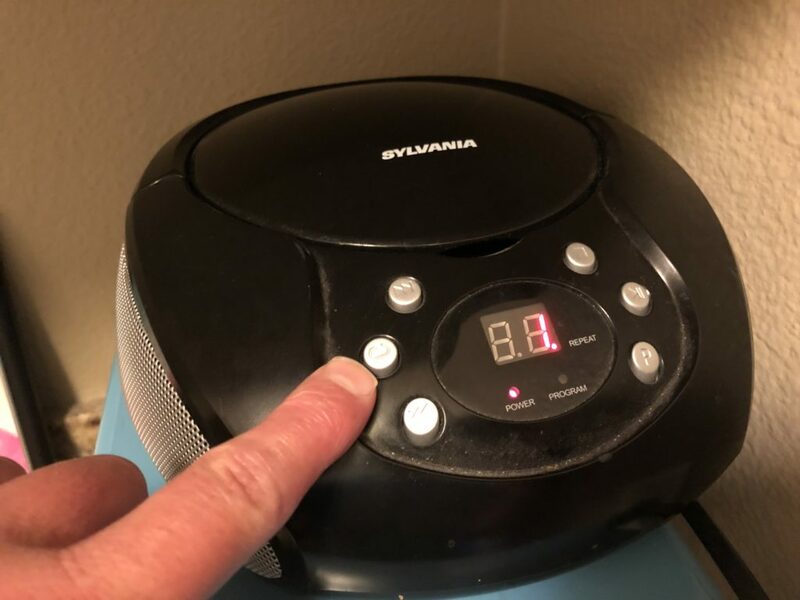 I use a basic CD player with a repeat or loop function. Today, every time I walk out of the house I hit play on that CD player. I’ve been using the same 5 minute recording of my voice for over 3 years now. I also still work on desensitization from time to time. Basically, my goal is to never fall into a routine where we leave the house using the same signals, alerting Splash to our leaving. While we had finally beat the separation anxiety, there was still one lingering issue: The side effects of the medication. One day I was working with a dog trainer who was working with Splash on some other things not related to anxiety. He commented that she seemed a bit dull and unresponsive to training. I told him about the Prozac, and he asked me whether or not I had tried CBD oil. I had heard things about CBD oil being good for anxiety, but didn’t believe I would be able to take Splash off her medication without serious issues. After talking with my vet, I decided to give it a try. I could always put her back on the drug, I thought. I began giving her CBD, and stuck to my usual process. I would always play the CD when I left, and still worked on desensitization from time to time. To my great surprise after several weeks off the medication and taking CBD, she continued to have no separation anxiety. But there was one added benefit, my spunky husky returned! Now off the medication, Splash began acting like her old self before the anxiety issues. She was smarter, more playful, more interested in interacting with our family, and far more trainable. I had my old dog back! Today when I return home, this is how I usually find Splash! To this day I still play the CD player recording of my voice every time I leave the house. I also work on desensitization on occasion, maybe once a month. I don’t give her CBD oil every day, but I will give it to her when we’re leaving for longer periods of time, just in case. (CBD oil is also helpful for other anxiety issues, it works great for Splash during 4th of July fireworks or thunderstorms). It’s been 3 years now since she has shown any signs of separation anxiety. 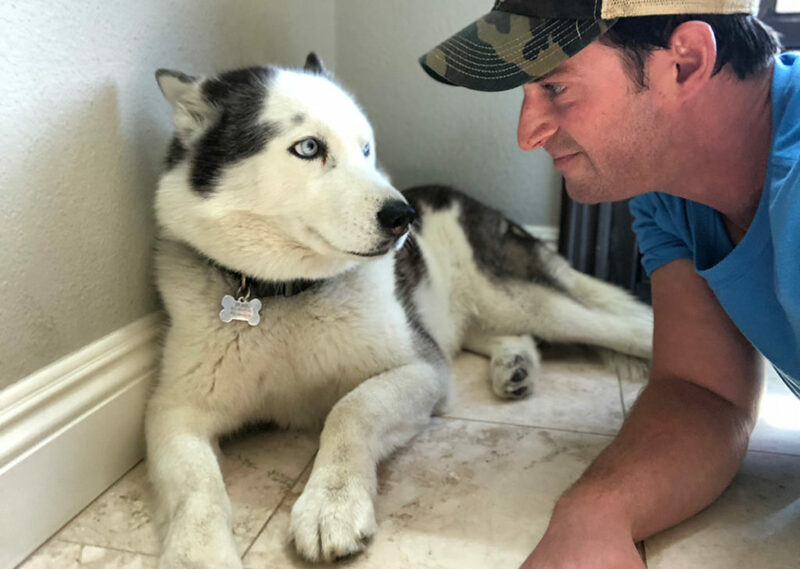 I have my dog back–and my life back! Know that the cure for separation anxiety is a process that will likely involve many components. Unfortunately, there might not be one magic silver bullet, it might be a combination of things like what I revealed in my story. If you’re battling separation issues with your pup, I hope my story has given you some hope. My solution may not be the exact solution for your dog, but I hope some of the tips and tricks will help. Keep at it, and never give up. Your dog is worth it!